Koi is a type of carp fish that are grown in artificial ponds, defined by unbelievably eye-ctching coloring. In nature carp is a river fish that hides in the slimy parts of rivers, but Japanese, using selection, turned those animals into swimming gems. 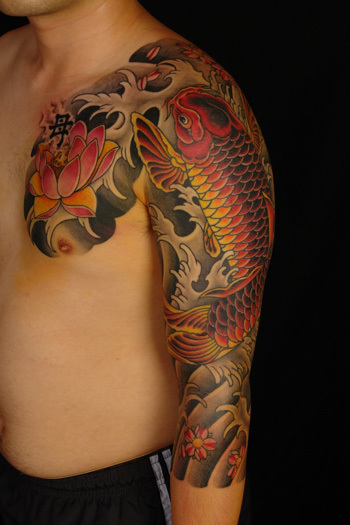 Their beauty made koi and important Asian symbol and a popular motif for tattoo design. The decorative carp called koi (in Japanese, nishikogoi) can be seen in gardens and parks of various countries. They were first bred in Japan in the 1820s, to become a delight for an eye. By the 20th century over 20 types of koi were established, varying in color combinations from gold to black. The pallete of this creature includes red, white, yellow, orange, blue, greenish and pearl. When resting, Japanese love watching the gracious movements of the carps they breed in their home ponds or in the ponds of traditional Japanese gardens. Those colorful creatures can be seen practically in all public gardens and parks of China as well, with red and gold koi prevailing over the other types. Western culture didn't remain indifferent to this beautiful tradition, inheriting oriental love for kois: for instance, there's a special ponds with these fish at Dr. Sun Yan Sen Chinese Garden in Vancouver. There're several legends about carp in China. One of them is about the Taoist immortal Qin Gao. He was sitting on the riverbank and called all fish to help him to get to the other side. He sat on the back of a giant carp, who brought him to this the opposite bank. And it occurred that 100 years had already passed. Quin Gao travelled across the country and learnt a lot. After he returned to the pond and the carp brought him back to the past. He shared all knowledge with his people, thus the image of an old man riding a carp symbolize wisdom and spirituality. Carp is a very strong fish with amazing will to life that can survive huge distance and colossal obstacles on its way to the spawning area. This carp's meaning gave birth to another well-known legend: On the Yellow River at Hunan Province, there is a waterfall called the Dragon Gate. It is said that if a carp can climb the cataract they will transform into a dragon. Endowing carps with such qualities stands for bravery, eagerness, steadfastness, optimism and ability to go through any troubles to reach your aim. More generally, the image conveys the moral that a person works hard and diligently, success will one day be achieved. Because of its immense valor, as the legendary carp manages to swim against the flow, it became a sign of success and military glory. In the tattoos this idea is visualized in the image of carp jumping out of the waters. Japanese has inherited many of Chinese legends about carps, appreciating its courageousness. They've also noticed carp's tranquility before the death. Its stoicism and composure, described in the legend of the Dragon Gate made koi a popular male symbol. That's why koi became an important part of Tango no Sekku (Boys' Festival), celebrated annualy on May 5th. And though nowadays it's celebrated as Kodomo no hi (Children's Festival), one ancient male-centered tradition has survived. It's called koinobori – large carp windsocks that are hanged outside houses of families with boys. There's one windsock for each boy in the house. The largest windsock stands for the oldest son of the house. Koinobori is a visualized wish for the boys to grow up into strong men, who can cope easily with any difficulty. The higher the windsock is placed the higher position the boy will obtain in the future. According to another ancient custom, when a boy is born, the family is gifted with a stick, decorate with paper or cloth figures of carp, signifying the protection of the higher powers for a kid. It's curious that Japanese, koi (carp) and koi (love, passion) are homonyms – the words, which have the same spelling or pronunciation but different meanings. As you can see, due to its character koi has an extensive symbolism, which makes him an interesting choice for a tattoo. Remember the story of Quin Gao riding the carp's back? In Japan such type of images is called "Hokuto-ki." It is traditionally perceived as a metaphor of manhood, strength, invincibility and triumph over difficulties, particularly appreciated by samurais, firefighters and other people of dangerous professions. But be careful! This tattoo subject is popular among members of Yakudza crime sindcate, so it'll be hardly welcomed in Japan. 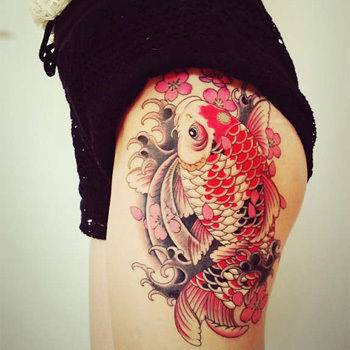 In other cases, carp image in Asian tattoos can signify joy of life, inner powers and family hearth (black – symbol of father, fire-red – mother, blue and white – of sun and pink - daughter). In Dracocarp type of Koi tattoo, fish design is merged with this popular mythological animal, to represent the endurance and willpower of its owner. It will also be a great image for people, who didn't give up in complicated situations and managed to get a new start, as dracocarp stands for the rebirth and new beginning. Also carp is a masculine symbol, girls and women don't remain indifferent to it as well, often combining it with lotus flower tattoo. This kind of drawing tells the story of purity, life changes and success. 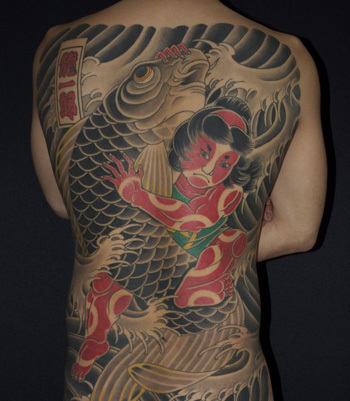 Japanese koi tattoos are usually made large-scale and applied on the full length of the back, legs or chest. However, it all depends on the desire of the owner – nobody can forbid you having a delicate and small design on your shoulder or hand! Just turn on your imagination!